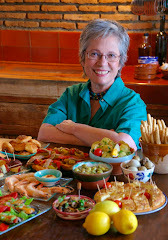 Many years ago, on a trip through the Sierra of Ronda, in Andalusia, we stopped at the mountain village of Grazalema for lunch. It was autumn and clouds swirled around pine-clad peaks, obscuring wondrous views, but closing us into the intimacy, immediacy, of watching that the edge of the road didn’t dissolve into oblivion. It was raining steadily in the village and no one was in the streets. We found a small inn where meals were served. We were the only guests. My questions, though, were only about the food, which was stupendous. One of us had wild rabbit—brought in that morning from traps—and cooked in a wine sauce. The other main dish was pork tongue—two tongues served whole, braised tender in a slightly sweet sauce. For dessert we were served dulce de membrillo, quince jelly, still slightly warm and quivery, a rosy color. The young man said his mother had made it that morning and it still wasn’t set. 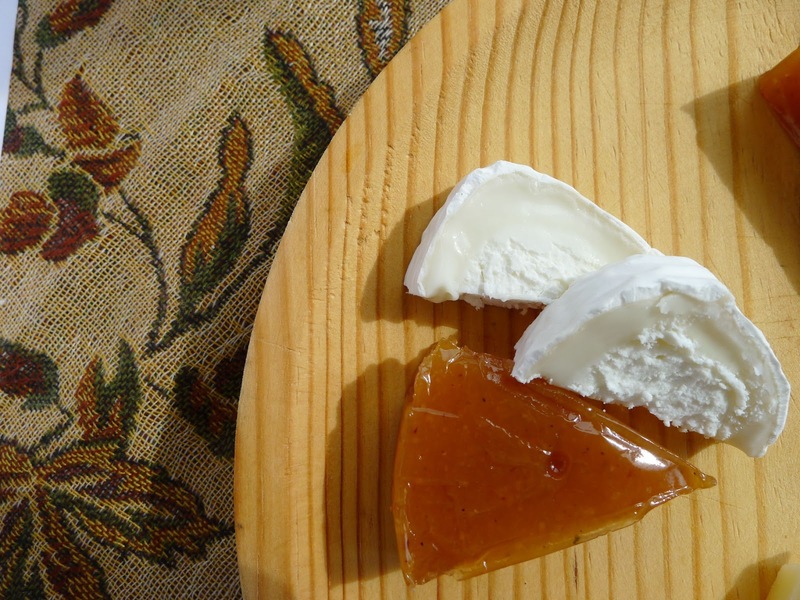 Quince jelly with aged sheep's milk cheese. 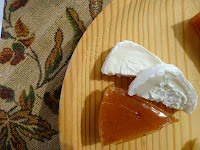 Quince jelly with queso fresco, fresh goat's milk cheese. Quince jelly with blue cheese. 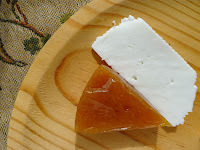 In Spain, quince (membrillo) is almost always a sweet, either as jelly or arrope, a compote of fruit cooked in sweet grape must (that recipe is here). Quince jelly is served with aged cheese as an hors d’oeuvre or with queso fresco, fresh cheese, as a dessert. 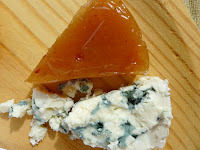 Quince jelly also can be turned into a sauce that goes well with duck, pork or cheese croquettes (that recipe is here). I haven’t prepared my own quince jelly in years—it’s easy to buy in Spain. In US supermarkets, look for it in the cheese section. 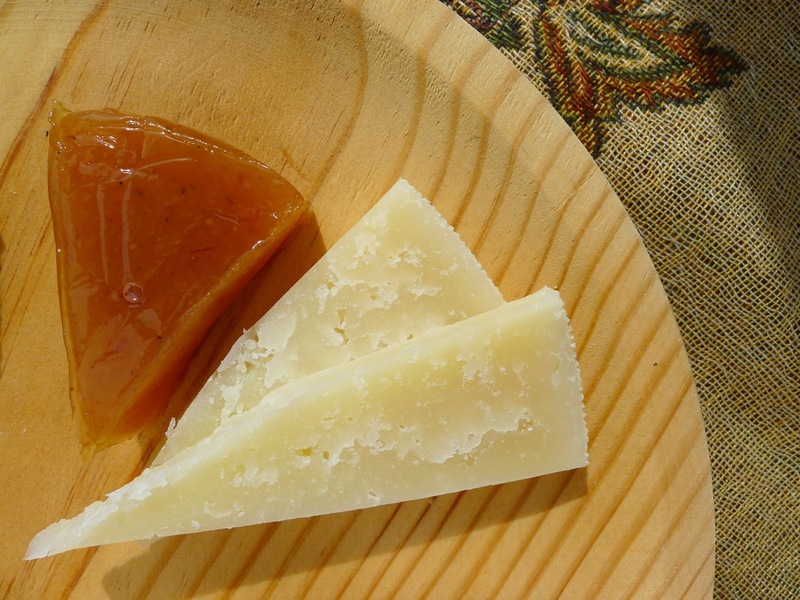 It's probably called "quince paste," rather than quince jelly. I wanted a savory dish with quince. 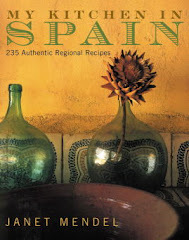 The only recipe I found in my collection that included quince was olla gitana, gypsy pot, a variation on potaje with chickpeas and vegetables, which included chunks of quince or pears, the wayfarer’s pickings. So, I looked beyond Spain and found that quince is cooked in savory dishes in several Mediterranean and Middle Eastern cuisines. 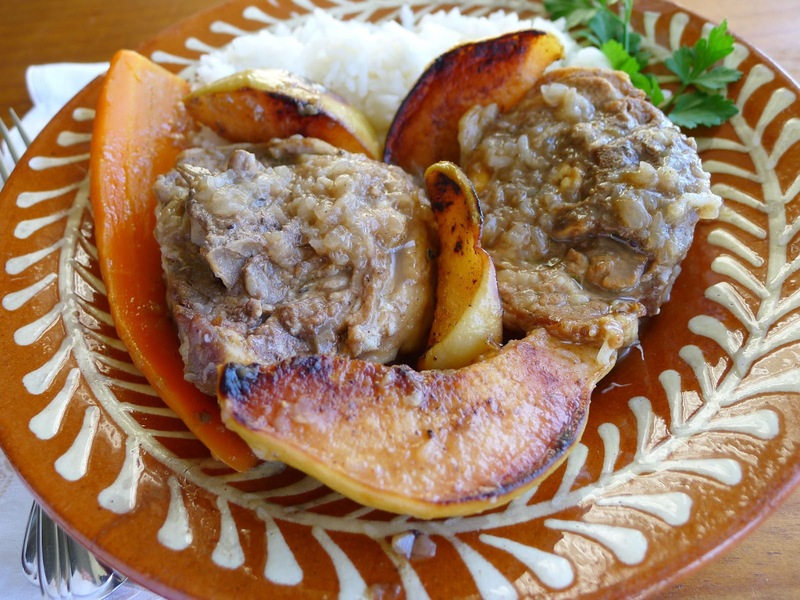 In Paula Wolfert’s Moroccan cookbook (the original) was Lamb with Quinces. 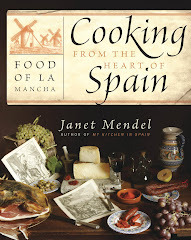 From Claudia Roden’s The Book of Jewish Food, I took Poulet aux Coings (chicken with quince), an Algerian dish; from Maideh Mazda’s In a Persian Kitchen came Koreshe Beh, lamb with quince, and from George Moudiotis’s Traditional Greek Cooking came pork with quince and red wine. 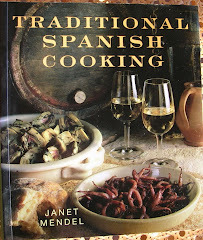 I put together several of these to prepare my dish of braised lamb with quinces. Lamb neck with quince slices. I used lamb necks (about 2 1/2 pounds) an economical cut. You could use lamb shanks, ribs, or boneless shoulder. Cut quinces into quarters, but do not peel. 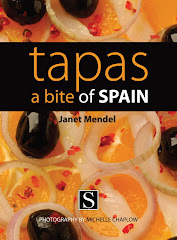 To prepare the quinces: Use 2 or 3 quinces for 4 servings. Wash the fruit. Place them on a cutting board and use a sharp knife to cut them into quarters. Place the quartered fruit in a pan with water to cover, juice of ½ lemon (to prevent quince from darkening), pinch of salt and (optional) cinnamon stick. 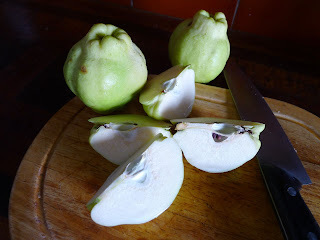 Bring to a boil and simmer, covered, until quince can easily be pierced with a skewer. Drain, saving the liquid. Allow the quinces to cool, then cut out and discard the cores. Cut into wedges. They do not need to be peeled. For the lamb. Finely chop a large onion (mini food processor works well). Heat 2 tablespoons olive oil in a heavy pan. Add the onions, 1 teaspoon of cinnamon, 1 teaspoon of powdered ginger, ½ teaspoon freshly ground black pepper and 1 teaspoon salt. Place the pieces of meat on top of the onions. Cover and let the lamb sweat for 15 minutes. Stir in 1 cup of reserved quince cooking liquid; 2 large carrots, halved lengthwise, and a pinch of saffron (optional). Cover and simmer until meat is fork-tender, adding additional liquid if necessary. 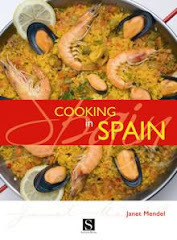 In a skillet, heat 1 tablespoon of olive oil. Sauté the sliced quince, turning to brown on all sides. This caramelizes the fruit’s sugar. (If desired, add a spoonful of honey or sugar.) Add the quince to the lamb and cook 10 minutes longer. Serve immediately or refrigerate overnight and remove congealed fat before reheating. Accompany with rice or couscous. The traditional recipe for quince jelly calls for cooking the quinces, putting them through a food mill, weighing the pulp and adding the same weight of sugar. Wash the quinces, cut them in half and put them in a deep pot with water to cover. Bring to a boil and cook them until they are tender if pierced with a skewer, about 45 minutes. Remove the quinces and cool them. Reserve the liquid. Peel and core the quinces. Puree the fruit in batches in a blender or food processor with 1 cup of the reserved cooking liquid. You should have 6-7 cups of puree. Combine the quince puree in a heavy pot with the sugar and cinnamon and let set for 30 minutes. Bring the fruit and sugar mixture to a boil, stirring constantly, then reduce the heat so it gently simmers. Cook the quince puree until it is reduced to a thick jam. As it cooks down, you will have to stir constantly so that it doesn’t scorch. The puree becomes glossy and translucent and begins to stick to the bottom of the pot—about 30 minutes. A test spoonful on a cold plate solidifies immediately. Remove cinnamon. Have ready a mold (4X12X3 inches) lined with plastic wrap, letting it extend beyond the edges. Spoon the quince puree into the mold. Rap the mold to settle the mixture. Let it cool overnight. Unmold the solidified puree. Cut into slabs and wrap to conserve. We are on the same wavelength again! I am also working on a quince post. 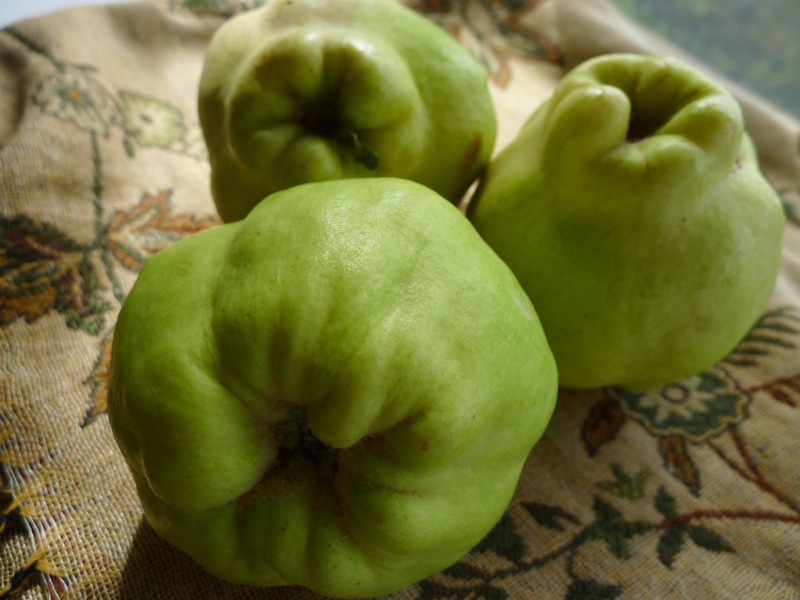 I love your story, recipes and descriptions - it is so true that quinces are "wonderfully old-fashioned." And the lamb stew looks perfect for the cooler days to come.